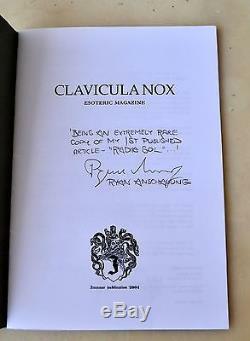 Clavicula Nox #1 ABRAXAS Signed Ryan Anschauung Johannes Nefastos Ixaxaar Satanic Occult Rare OOP. 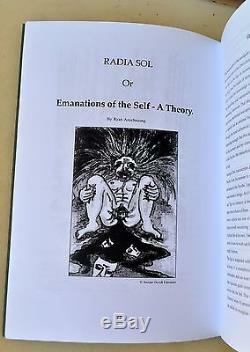 Rare, Out of Print copy of Clavicula Nox, Issue #1: ABRAXAS, which includes a rare early essay by Ryan Anschauung, titled "Radia Sol: Or, Emanations of the Self - A Theory". This copy belonged to Ryan Anschauung, and has been signed by him. 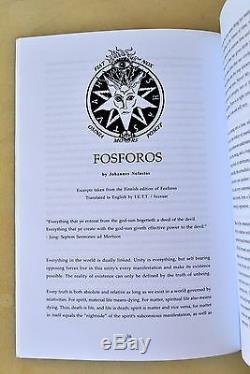 There are also essays by Karl N Eng, and Johannes Nefastos' "Fosforos" - which includes translated excerpts from the Finnish edition of. This copy is in Mint condition, with the pages being clear & crisp. 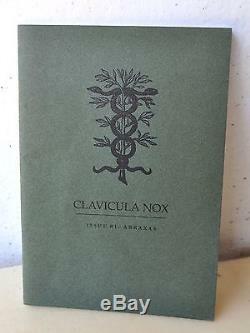 These early Ixaxaar Clavicula Nox journals are highly sought after, and rarely turn up. This copy has special provenance, as it belonged to Ryan Anschauung, who has signed it! Note: The Letter of Provenance from Ryan Anschauung (using his real name of Kris McDermott), which I have reproduced in the last photo, is for reference purposes only, and is not included in this sale. Some Further Information Regarding This and Other Items From Ryan Aschauung/Temple of THEM. Early in 2015, I was contacted by Ryan Anschauung (author, artist and creator of the Temple of THEM, and the Black Glyph Society), to see if I might be interested in purchasing one of his paintings. Most of the items were of an extremely limited nature - some of the books, like. There were only around 12 copies produced worldwide, and were essentially made available to members, or those interested in the Temple of THEM. Even more rare was the "Portals" Sinister Tarot. Only 4 sets of oversized "Portals" Sinister Tarot were produced, and I have the one which belonged to, and was used by Ryan, in training members of THEM. Other books by Ryan, such as. Have been signed, and I also have signed copies of. And a rare signed copy of. 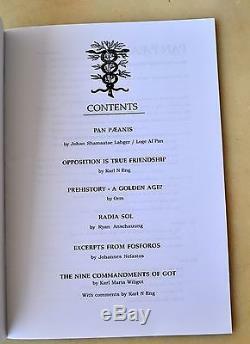 (which contains an early essay by Ryan). In addition, I have his "Cosmic Wheel" painting, which comes with a signed and framed certificate. 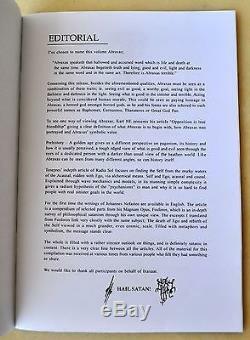 But without doubt, the most significant and desirable item is the unique prototype deck of the Emanations tarot, which was Ryan's personal deck, and which comes with all the additional items, and includes a hand-written letter of provenance. Please check out my other items. As I have many other Ixaxaar titles listed, as well as rare books by Anton LaVey, Austin Osman Spare, Aleister Crowley, Kenneth Grant and many other rare titles, with more to come. Check out my other items. Be sure to add me to your favourites list. 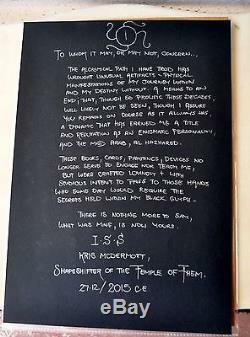 The item "Clavicula Nox 1 ABRAXAS Signed Ryan Anschauung Johannes Nefastos Ixaxaar Satanic" is in sale since Sunday, January 17, 2016.